breathable Flux drytop is our slickest, most comfortable design ever. The Flux's design is precision-patterned for comfort in any season, with materials that make this top drier and lighter-weight. 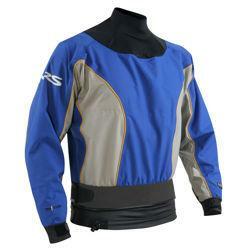 Durable and lightweight 3-layer 210-denier TriTon™ fabric is waterproof and breathable. Tough latex gaskets at the neck and wrists keep water out. Double-tunnel design meshes with your kayak skirt tunnel. Inner skirt and 3" double-pull waist adjustment help prevent water from sneaking in. Neoprene volcano-style neck over-cuff has GlideSkin inner surface that's smooth and comfortable on your neck. Stretchy polyurethane over-cuffs at the wrists are smooth and comfortable against your skin and protect the latex gaskets.